It is an eye that does not see – at least not as others do. The ‘third eye’ in Hindu and Buddhist tradition – the alleged source of hidden powers and clairvoyant vision – may be linked to the pineal gland. In some reptiles the pineal is an eye with a lens and retina, covered by a flap of skin or scales. In other animals it is a light-sensitive gland under a thin shell of skull. In humans the tiny gland lies deep in the center of the brain. Its function has proved hard to find. Galen, the second-century AD Greek physician, believed it regulated the flow of thought. Fifteen centuries later, the philosopher Rene Descartes called it the ‘seat of the soul’. Then in 1958 Aaron Lerner of Yale University discovered that it produces melatonin, a hormone that acts as a sedative and so controls the sleep cycle. Today, occult schools link the pineal with the crown chakra, the vortex through which psychic and spiritual energies from the universe are said to enter individuals. 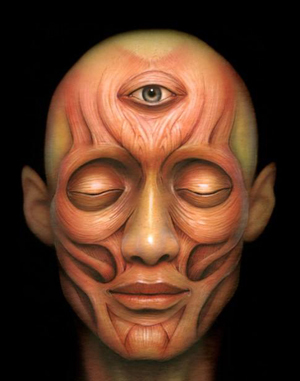 The pineal gland also has links to ‘enlightenment’. The Buddha sat under a bo tree, whose fruit – like bananas and walnuts – is supposedly rich in serotonin, an organic compound the pineal needs to make melatonin. Studies have shown that melatonin, when it is taken orally, produces a state of wellbeing and tranquility that could very easily be interpreted as exaltation. We as spiritual beings naturally see, it’s part of our nature. Seeing through eyes, which means looking through two holes, but which serves us with many fancy signals from a colorful toy, even TV or even WWW such as here. We can refocus our inner eye away from the physical eyes. This is called activation of third-eye, in a passive observing way. This is the most common case in western society. We are very visually oriented, and our technically oriented attention and research needs a high degree of ability to perceive physical reality in order to change it as we did mainly with industrialization, as an example. Those keen to learn more about these eyes, can google on inner realization versus technology. The physical eyes serve impressions of the physical reality to the inner eye, which indicate with the presence in the middle of the head (point of presence). If your physical eyes get prepared by yourself, and reduce the traffic of information, you slowly and partly will watch through the inner eye, or third eye, which may give you impressions beyond physical reality. This case is somewhat rare, and is only achieved with a lot of practice and inner allowance. Giving up the attention to physical eyes is dependent on a deep trust that there is more than physical reality, and often there is a lot of fear involved, deep fear to lose any orientation of physical reality. Here are some well known preparations, which you can practice to open and prepare yourself. You can do it daily, or even weekly in circles, whatever you prefer. 1) Take a candle, watch the flame for a period of time, about 1-2 minutes. Try to think calming thoughts, try to feel the room you are in, and feel comfortable with yourself. Don’t stare until your eyes tear, but simply watch the flame, and allow your thoughts to calm as your body does too. Try to establish a meditative state, but different than a common meditation: with open eyes. 2) If you have a pet, like a cat or dog, try to watch her or his eyes, and relax and try to establish a deep peace in you. Pets usually reflect humans’ emotions and thoughts and therefore teach us our own inner peace by surrounding humans. 3) Watch your face in a mirror. Look at your face, in a kind of distance, saying to yourself: That’s now my face, it’s part of myself, my physical body, my vehicle. Try to watch your own face for 1-2 min. too, with dimmed light if possible instead of bright light which might hurt your eyes. 4) If you feel better in nature than in your own apartment, look for a place where you feel totally calmed and relaxed, for example a beach, or river. Try to achieve a meditative state, but as mentioned, with open eyes. It’s simply important, that you can calm with open eyes. It’s much easier to calm and relax yourself with closed eyes, when the visual influences are disabled that distract our inner being, but for this procedure it’s quite helpful to reach the same state with open eyes. Fred: “Babies seems to know their present also. This is because, some Malays says that if the baby cried uncontrollably, they might have seen ‘it’ or felt their present. 5) High fever or accident, survived through fatal experiences.